1973-08-09. New. Ships with Tracking Number! INTERNATIONAL WORLDWIDE Shipping available. Buy with confidence, excellent customer service! 1973-06-05. New. Ships with Tracking Number! INTERNATIONAL WORLDWIDE Shipping available. Buy with confidence, excellent customer service! TBS The Book Service Ltd. Hardcover. 0882250264 New Condition. . New. Newsweek. Hardcover. 0882250272 New Condition. . New. 1973-08-09. Good. Ships with Tracking Number! INTERNATIONAL WORLDWIDE Shipping available. May not contain Access Codes or Supplements. May be ex-library. Shipping & Handling by region. Buy with confidence, excellent customer service! 1973-06-05. Good. Ships with Tracking Number! INTERNATIONAL WORLDWIDE Shipping available. May not contain Access Codes or Supplements. May be ex-library. Shipping & Handling by region. Buy with confidence, excellent customer service! New York: Newsweek. Very Good+ in Very Good+ dust jacket. 1973. Hardcover. 0882250264 . Binding not tight; The very symbol of the cradle of democracy is here profiled; Wonders of Man; B&W and Color Photographs; Small 4to 9" - 11" tall; 172 pages . TBS The Book Service Ltd. Hardcover. 0882250264 Like New Condition. . Fine. Newsweek. Hardcover. 0882250272 Like New Condition. . Fine. London: Reader's Digest, 1973. Hard Back. Very Fine/Very Fine. 1 St UK Edition. 20x232x298mm. 172pp, brown cloth, full colour printed DJ. History of athens, it's impact on the world and decline. Athens in literature, Illustrated with over 120 illustrartions many in colour. London, UK. : The Reader s Digest Associaton Limited, 1973. This is the first edition. POSTED AT OUR STANDARD RATES FULLY INSURED! (UK ONLY). FEEL FREE TO E-MAIL FOR PHOTOGRAPHS AND FURTHER DETAILS. FROM A DEALER WHO TELLS YOU WHO THEY ARE AND WHAT THEIR TELEPHONE AND ADDRESS CONTACT DETAILS ARE!. Not Signed or Inscribed. Brown Cloth. Very Good (AVERAGE)/Very Good (AVERAGE). Illus. by Pictorial Illustrations Throughout.. 4to - over 9¾" - 12". HARDBACK. New York: Newsweek, 1978. 5th printing, deluxe edition (leatherbound). . Hardcover in brown stippled padded leather boards w gilt spine titling, in color-photo jacket.. Fine unmarked, in Fine bright jacket.. One of a series that focuses on well-known historical monuments. Each presents historical information, profuse illustrations, literary excerpts, and a reference section. Nice bright clean tight copy of the deluxe leatherbound edition. 9-1/4 x 10-1/2, 172 pp, index, bibliograpy, chronology, b/w & color photos & illus, color-illus endpapers. Condition: Fine unmarked, in Fine bright jacket. Edition: 5th printing, deluxe edition (leatherbound). Newsweek, January 1973. Hardcover Hardcover. Very Good/Very Good. Very Good Hardcover with Very Good- Dustjacket. Light soiling and shelfwear to DJ. Interior of DJ foxed. Light soiling and shelfwear to covers. Textblock soiled/foxed. Pages clean and tight in binding. Pictures available upon request. A locally owned, independent book shop since 1984. New York: Newseek, 1973 Well illustrated large format book about the Parthenon . 152p. illus. (some col) bibliography.index. 1st.US Ed... Hard Cover. Fine/Fine. NY: Newsweek, 1973 Special Presentation Binding. Fine/Very Good+. First Edition. Major Publisher. 4to - over 9¾" - 12" tall. Book is pristine and beautifully illustrated. Dust jacket has very light edge wear and one mended edge tear on back cover..
New York: Newsweek, 1973. 9 inches wide by 11.5 inches tall. A beautiful copy of this handsomely produced book. No owner's name or bookplate. No remainder mark. Bright, clean, square, tight, and unmarked. Sharp corners. Appears unread. Full-color pictorial endpapers. Fine brown linen binding. Photo illustrated throughout, most in full-color. 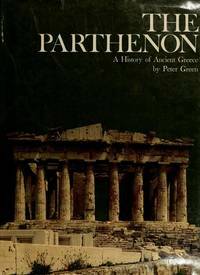 Has sections on The Parthenon in History; The Parthenon in Literature; Chronology of Greek History; Guide to Ancient Athens. Selected Bibliography. Index. . 1st ed? (no other printings indicated). Hardcover. Fine condition/Fine dust jacket. 172pp. New York: TBS The Book Service Ltd. Hardcover. 0882250264 No marks or damage from past owners, not a former library book, not a remainder or book club, not clipped, Hardcover. Jacket is scuffed up a bit. Published in the United Kingdom by The Readers Digest Association Limited, London. Acropolis, Greece, History / Ancient / Greece, Parthenon (Athens, Greece), Social Science / Archeology. All books shipped within 24 hours with U.S. Postal Service Delivery Confirmation, each order is packaged in a new box with bubble wrap, and always your satisfaction is guaranteed. . Very Good. 1973. 1st Edition. TBS The Book Service Ltd. Hardcover. 0882250264 (6th Printing; 1981) Hardcover with Dust Jacket. Book: Boards with minor shelf wear. Pages unmarked. Binding with no separations. DJ with shelf wear. no tears **Tracking on all US orders. Most orders shipped within 24 hours. International customers will be reimbursed a portion of unused shipping charges.*** . Very Good. Jan 01, 1973. Very Good. Newsweek. Used - Good. Shows some signs of wear, and may have some markings on the inside. Newsweek. Used - Good. Ships from Reno, NV. Former Library book. Shows some signs of wear, and may have some markings on the inside. 100% Money Back Guarantee. Shipped to over one million happy customers. Your purchase benefits world literacy! New York: Newsweek, 1973. A well illustrated history. Volume of 'The Wonders of Man' series.. Hard Cover. Very Good/DJ Very Good. Quarto. NY: Newsweek, 1981. 172pp. Pictorial endpapers. Illustrated. All edges of the text block spotted. Some surface scuffing to the jacket. Size: 4to - over 9¾" - 12" tall. Sixth Printing. Original Cloth. Very Good/Very Good. Book. Newsweek, 1973. Hardcover. Good. Disclaimer:A copy that has been read, but remains in clean condition. All pages are intact, and the cover is intact. The spine may show signs of wear. Pages can include limited notes and highlighting, and the copy can include previous owner inscriptions. An ex-library book and may have standard library stamps and/or stickers. Newsweek, 1973. Hardcover. Good. Disclaimer:A copy that has been read, but remains in clean condition. All pages are intact, and the cover is intact. The spine may show signs of wear. Pages can include limited notes and highlighting, and the copy can include previous owner inscriptions. At ThriftBooks, our motto is: Read More, Spend Less.Dust jacket quality is not guaranteed. Newsweek, 1973. Hardcover. Very Good. Disclaimer:A copy that has been read, but remains in excellent condition. Pages are intact and are not marred by notes or highlighting, but may contain a neat previous owner name. The spine remains undamaged. At ThriftBooks, our motto is: Read More, Spend Less.Dust jacket quality is not guaranteed. Reader's Digest. Very Good in Very Good dust jacket. 1973. Book Club Edition. Hardcover. 0882250264 . Dw has fading to spine and a single strip of cello to front and rear dw flap, adhering it to paste-downs, small ara of minor thin line indents to cover. A heavy item that will require additional shipping for overseas customers on some sites. ; 4to 11" - 13" tall; 172 pages . Newsweek, 1973. Hardcover. Good. Tall hardcover. Sound & nice copy, light to moderate edgewear. Jacket is bright & clean, light to moderate rubbing/edgewear. May not be available for international shipment at usual rates due to weight/size. TBS The Book Service Ltd. Hardcover. 0882250264 Very Good Condition. Has some wear. Five star seller - Buy with confidence! . Very Good. TBS The Book Service Ltd, 1973-06-01. Hardcover. Very Good. TBS The Book Service Ltd. Hardcover. 0882250264 Missing dust jacket. Acceptable Condition. Five star seller - Buy with confidence! . Fair. TBS The Book Service Ltd. Hardcover. 0882250264 Meets the good condition guidelines. Has a large tear. Has wear. Five star seller - Buy with confidence! . Good. Newsweek. Hardcover. VERY GOOD. Light rubbing wear to cover, spine and page edges. Very minimal writing or notations in margins not affecting the text. Possible clean ex-library copy, with their stickers and or stamp(s). TBS The Book Service Ltd. Hardcover. POOR. Noticeably used book. Heavy wear to cover. Pages contain marginal notes, underlining, and or highlighting. Possible ex library copy, with all the markings/stickers of that library. Accessories such as CD, codes, toys, and dust jackets may not be included.